Not for the first time, my new year's resolution is to make more of a fuss of our friends. Why? Well, within the past 15 months, Teddy and Peggy, husband and wife, both died and I was too busy on Home Truths business to go to either of their funerals, although Sheila did. I have felt twinges of guilt over this ever since, because they were people we loved and Teddy had been responsible for keeping me in work on Radio 1 for years. Then, just before Christmas, we went to Liverpool. I had been awarded an honorary doctorate by Liverpool University for reasons that were never entirely clear to me. My dad would have been proud of me in a what-has-that-damfool-boy-done-now? sort of way, I thought, and was touched and pleased. William, who had won a degree from the same university through, he maintains, the sweat of his brow, a substance produced in exceedingly limited quantities, affected to be outraged that I could just turn up in Liverpool for a morning and return to East Anglia with a doctorate, but when I checked with him he didn't seem to mind really. The ceremony took place in the Philharmonic Hall, the very venue in which we had sat to watch William graduate two and a half years ago - with me trying not to cry - and in which, years before, I had introduced a performance by David Bowie to a rapt audience of young persons. Interestingly the young persons were not there, by and large, to see Bowie. Rather they were gathered together in the name of Mark Bolan and Tyrannosaurus Rex, shortly to transmute into T. Rex. David was doing his mime act then - with me trying not to laugh - and was bottom of the bill, below an Australian sitar player. I had no idea then, as I have no idea now, of the strength in depth of the sitar-playing tradition in Australia but if I remember correctly, our man made up in sincerity for what he lacked in skill. Next week: the Didgeridoo in Karnataka: a Sideways Glance. Afterwards we were invited for lunch at the home of the university's vice chancellor and I sat down next to a place-setting in front of which there was no chair. Asking about this, I was told that the poet and painter Adrian Henri - a wheelchair user - was expected. Sheila and I were pleased about this, having spent a fair amount of time with Adrian in the late sixties and early seventies, but we were warned that ill health might keep him from attending either the lunch or the afternoon's ceremony, at which he, too, was due to be honoured with a doctorate. Our paths had first crossed shortly after I started reading Adrian's poetry, along with that of his fellow Liverpool - based poets, Roger McGough and Brian Patten, on the pirate station, Radio London. I read it all extremely poorly but they were all too kind to laugh out loud. Firstly I met Andy Roberts, Adrian's friend and accompanist, and eventually the great man himself. Adrian and Andy were in our flat when the Americans first walked on the Moon, and they were with us when Sheila and I had our first, brief holiday together in Ireland. One afternoon, in a place I've never been able to put a name to since but believe to have been a few miles north of Athlone, we walked across meadows filled with wild flowers to picnic in the sunshine beneath the walls of a great castle, sitting on smooth rocks in the shallows at the edge of the lake that surrounded the crumbling fortifications on three sides. On the way across the fields and surrounded by all this faintly excessive loveliness - I originally typed in the words "the swooning air was heavy with butterflies" but thought better of it - we had stumbled across the corpse of a cow. Adrian had insisted on photographing it from several different angles and in close-up and I was rather appalled. Later I came to understand that that was why he was an artist and a poet and I was a DJ. Over the next few years I did gigs with Adrian and Andy's band, the Liverpool Scene, and am named as producer of their first LP. The most memorable of those gigs was an anti-nuclear concert in a park in east London. The locals didn't much care for the hippies and protesters in their midst and made their feelings known by pelting the stage with stones, bottles and cans, leaving me, understanding it to be part of my duty as compere, to protect the artistes, hopping about the stage fielding missiles as Adrian and the band soldiered on behind me. They were playing, among other things, their 1969 mini-hit and the dance sensation that, to be honest, wasn't sweeping the nation, The Woo Woo. The East Enders weren't ready to woo woo. Adrian stayed in Liverpool and we stayed in Stowmarket and we lost touch over the years. But this autumn (2000) Sheila and I saw him, briefly, at a birthday party in Heswall. He looked desperately ill, but in that irrational way you do with people you envy for their ability to derive everything there is to be derived from life, we assumed that somehow Adrian would take up his bed and walk and become a force for good all over again. As you know, Adrian didn't revive, he didn't take his place at the vice chancellor's lunch and two days later I heard on the Today programme that he had died. "As I said, we should make a fuss of our friends". After reading the article, I realised it coincided with a picture which I have had for a few years since the Peels gave me a copy. 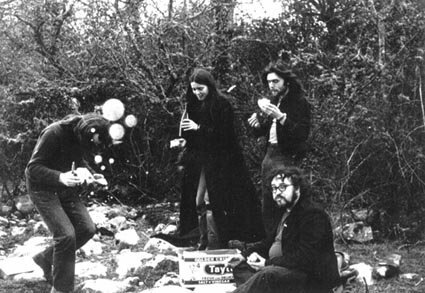 Basically that's us, sitting on the smooth rocks: Adrian stuffing his face and scanning the landscape for cow carcases, John Peel doing his famous butty dance, surrounded by bubbles (a photographic defect, methinks), and the delectable Sheila Gilhooley, being delectable. Oh, and me. Photo credit unknown, but could be B.P.Fallon.